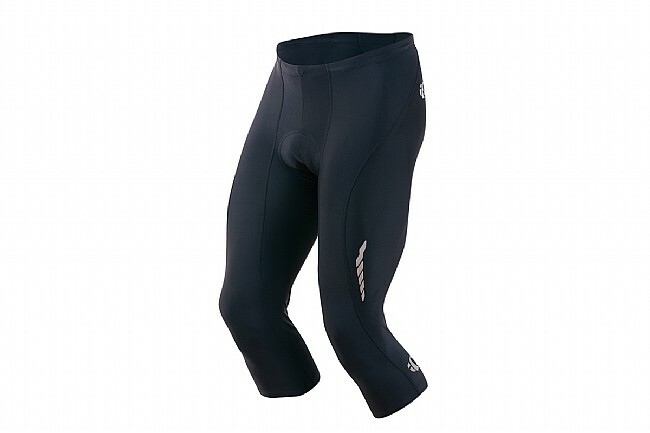 Keep knees covered on cooler days with Pearl Izumi's affordable yet comfortable Pursuit Attack 3/4 Tight. This knicker is built from moisture wicking SELECT Transfer fabric and features a seamless, medium-density, SELECT Pursuit 1:1™ Chamois for cushioning and support. The 8-panel anatomic design provides a body-contoured fit. Features reflective accents for increased visibility. 18" inseam (size medium). You can count on Pearl Izumi products. Perfect for cool days when tight are too warm. Typical high quality PI pad and fit. If this were a short I would rate this 5 starts. This gets 4 stars as a 34 length, however, because it does not add any wind protection for my knees compared to a short when riding my average 16-18 MPH. If temperatures dictate wearing knee warmers with shorts, I need knee warmers with these. Fit is good (xl) for this rotund rider. Nice 34 tight. Lighter fabric than anticipated. Good for moderate weather, or cooler mornings of a warming day. The sizing chart put me smack-dab in the Medium category, but in reality, Large would have been better. I can get into them, but would be more comfortable in Large.